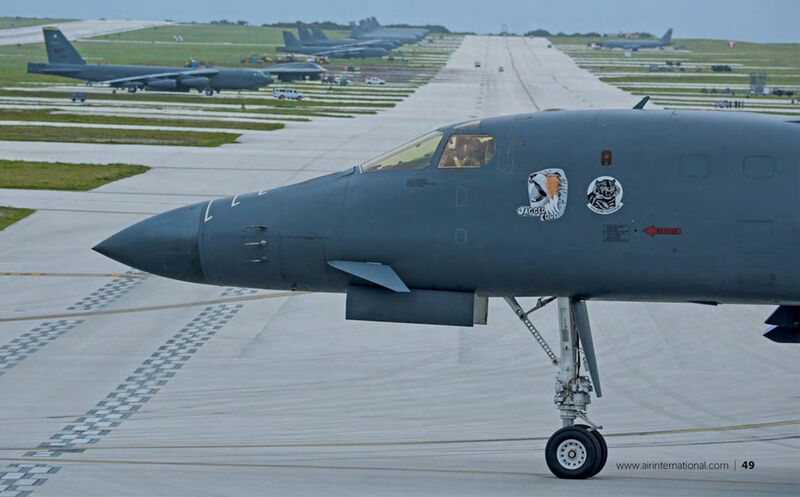 A B-1B Lancer at Andersen Air Force Base, Guam on August 17, 2016 prior to the first mission in history in which all three of Air Force Global Strike Command's strategic bomber aircraft (B-1B, B-2 and B-52H) conducted integrated operations in the US Pacific Command area of operations in support of the continuous bomber presence mission. 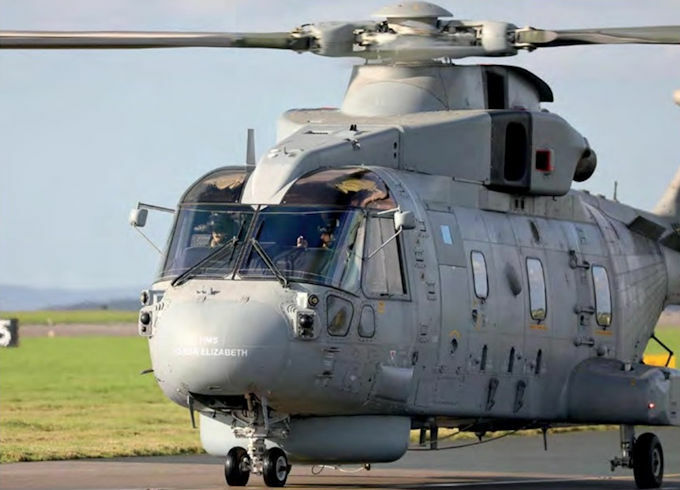 A Merlin HM2 assigned to 820 Naval Air Squadron with HMS Queen Elizabeth titles. 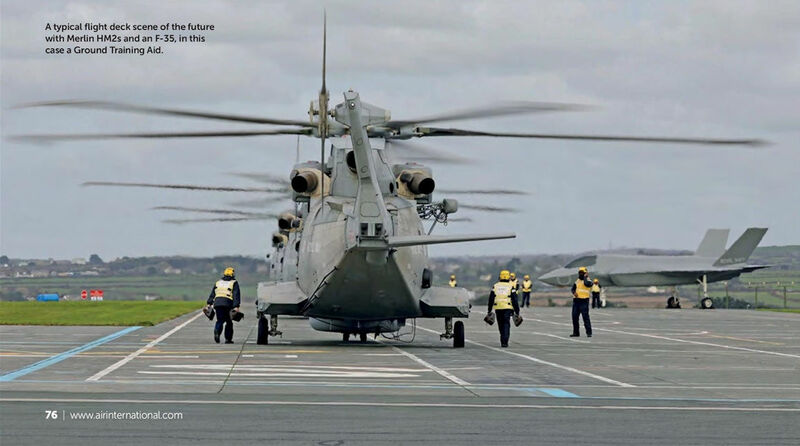 Merlin HM2s prepare to touch down on HMS Seahawk's flight deck attended by Royal Navy flight deck handlers. 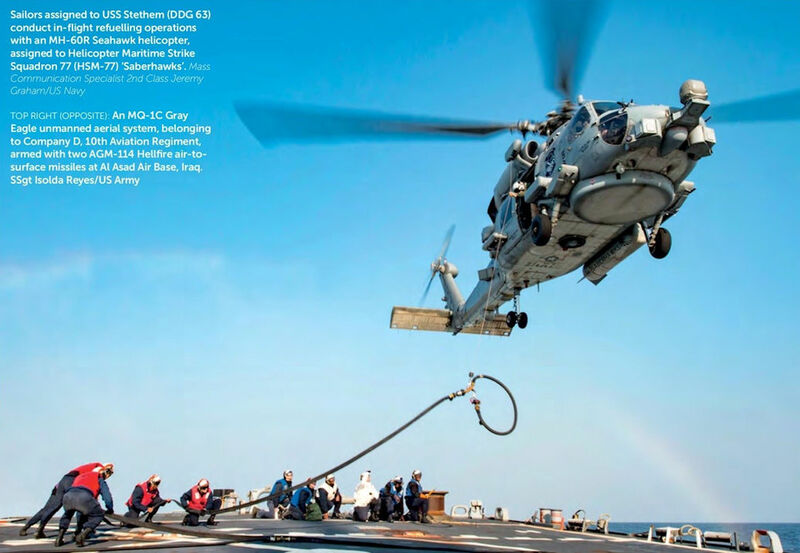 A typical flight deck scene of the future with Merlin HM2s and an F-35, in this case a Ground Training Aid. Two F-35B Ground Training Aids, a Merlin HM2 and two Sea Harrier FA2s on the dummy deck, dubbed HMS Seahawk, during Exercise Kernow Flag. F-15C Baz 840, marked with three and a half Syrian Air Force roundels each denoting an aerial victory (two MiG-23s, one MiG-21 and a shared MiG-23) from the 1980s, on take-off from Ovda Air Base during Exercise Blue Flag 2017. 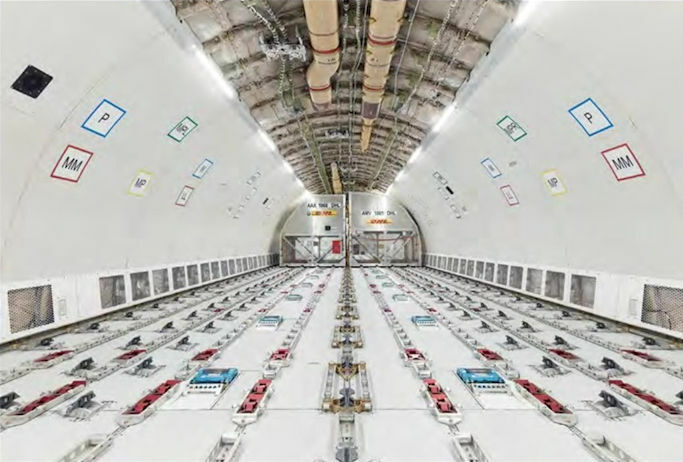 The aircraft is carrying an IAI-Elta electronic countermeasures pod on station 3. 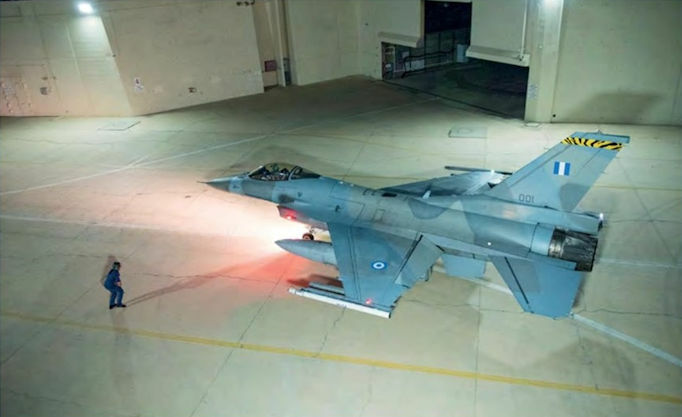 Elliniki Polemiki Aeroporia Block 52+ F-16C 001 inside one of the hardened aircraft shelter sites at Ovda Air Base. 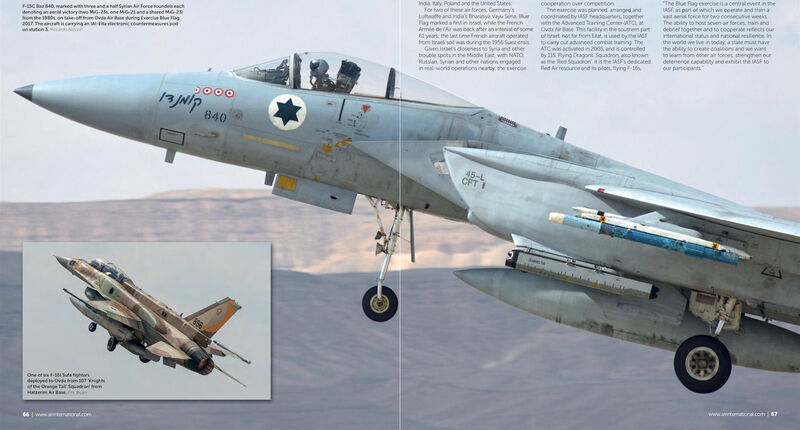 A Sily Powietrzne Rzeczypospolitej Polskiej Block 52+ F-16C taxis by an Israeli Air and Space Force, 122 Squadron, G550 Nahshon-Eitam Conformal Airborne Early Warning aircraft. 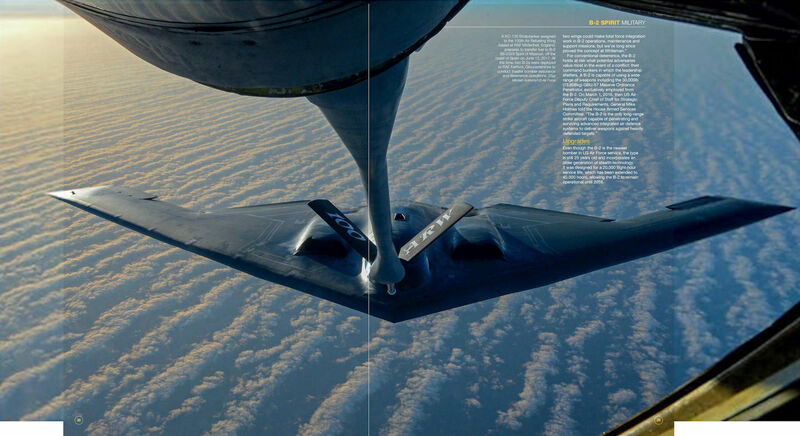 This shot shows the conformal cheeks housing antenna of the Elta EL/W-2085 phased array airborne early warning radar. 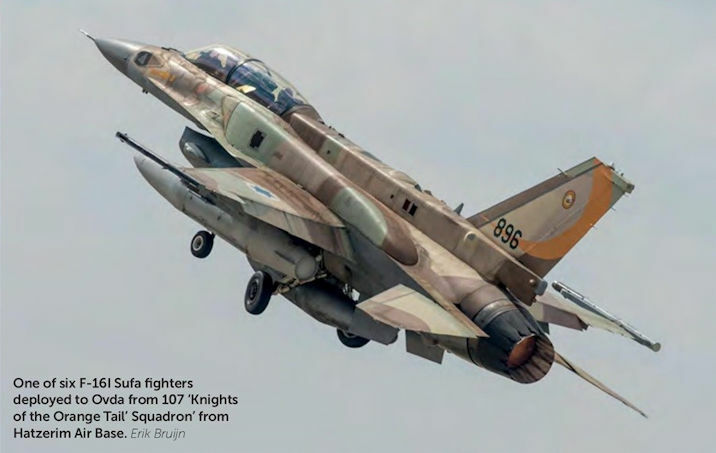 One of six F-16I Sufa fighters deployed to Ovda from 107 'Knights of the Orange Tail' Squadron' from Hatzerim Air Base. 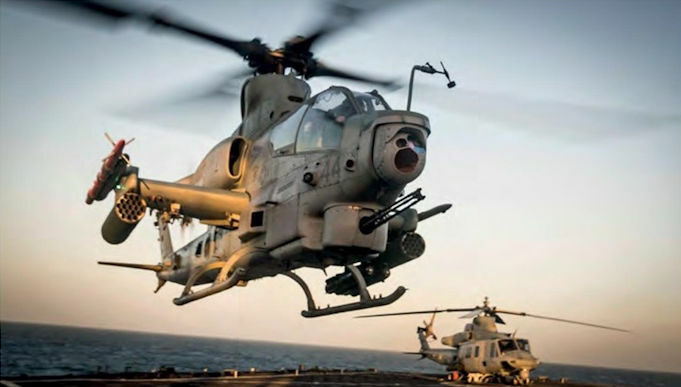 An AH-1Z Viper attack helicopter takes off from the flight deck of amphibious dock landing ship USS Pearl Harbor (LSD 52) during flight operations to enhance interoperability between Navy ships and Marine aircraft as part of a Composite Training Unit Exercise. 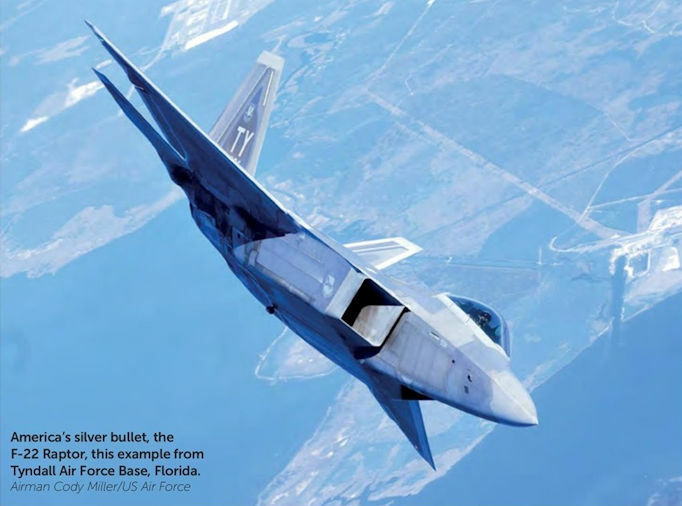 America's silver bullet, the F-22 Raptor, this example from Tyndall Air Force Base, Florida. 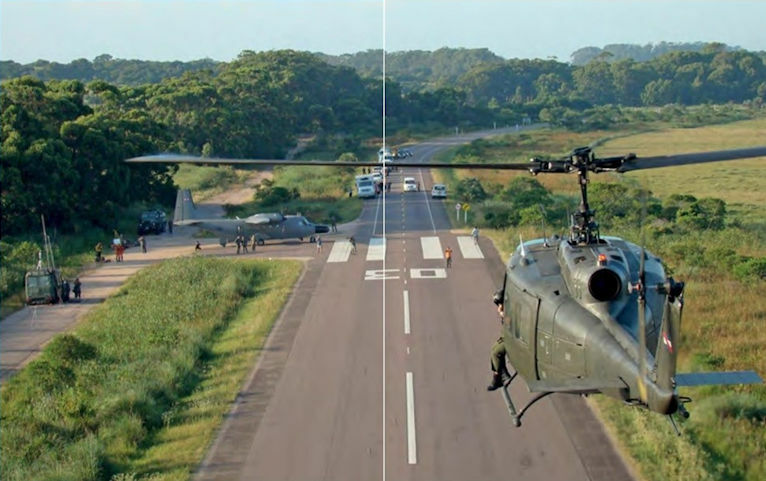 An FAU UH-1H Huey approaches to land with a C212 Aviocar parked on the circular section of the road also used by the Dragonflies to park overnight. 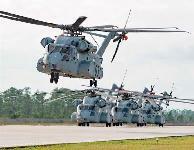 A US Army MH-47G Chinook with the 3rd Battalion, 160th Special Operation Aviation Regiment at the Gulfport Combat Readiness Training Center, Mississippi, during a multi-service training exercise called Southern Strike. Dragonfly FAU282 lifts off from Ruta 9. Adjacent to the road, in the background, is the squadron's communication hut. 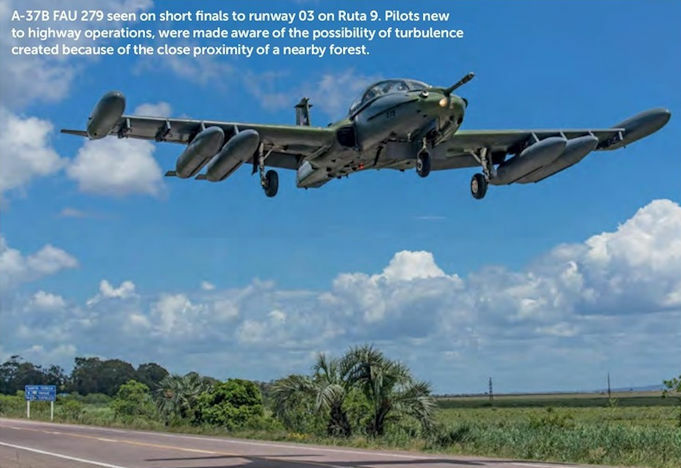 A-37B FAU 279 seen on short finals to runway 03 on Ruta 9. 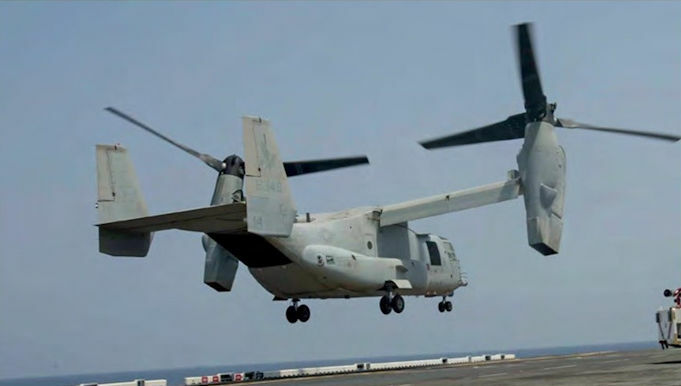 Pilots new to highway operations, were made aware of the possibility of turbulence created because of the close proximity of a nearby forest. 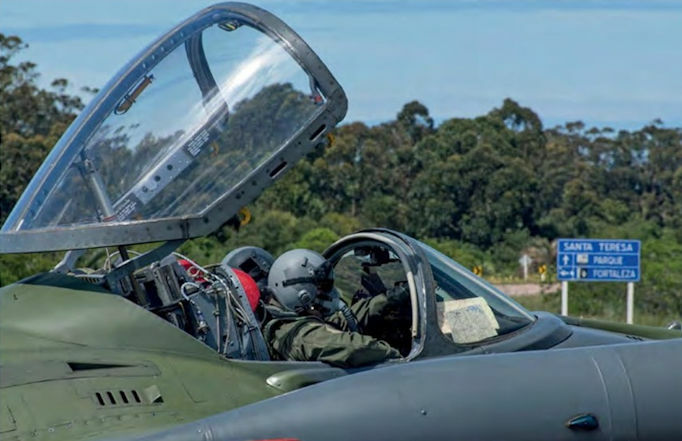 A-37B FAU 279 flares prior to landing on Ruta Nacional No. 9. 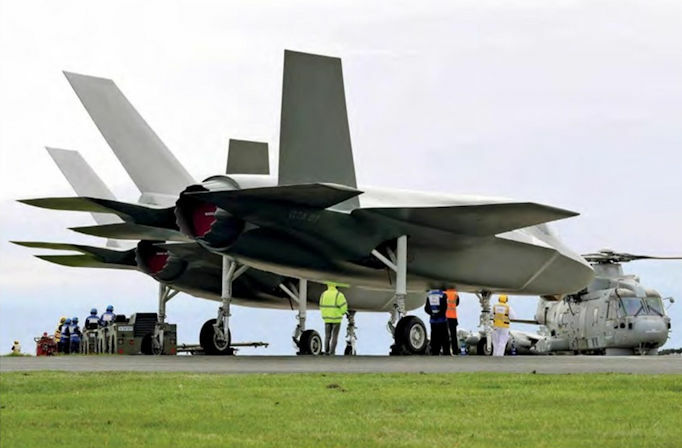 After missions, the A-37Bs parked on a circular hardstand at the east end of the runway. 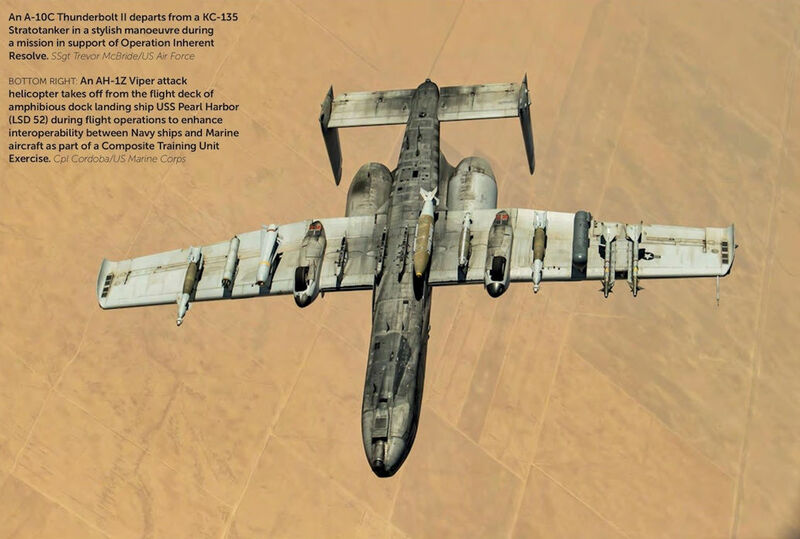 All pilots flew without squadron patches on their flight suits and carried their service issued 9mm pistols. 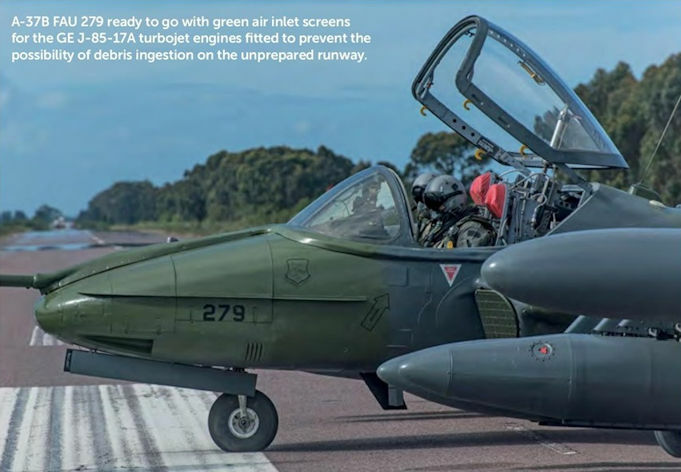 A-37B FAU 279 ready to go with green air inlet screens for the GE J-85-17A turbojets engines fitted to prevent the possibility of debris ingestion on the unprepared runway. 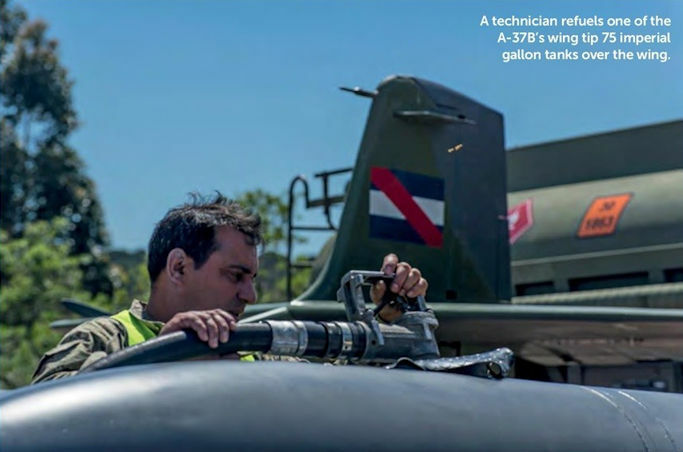 A technician refuels one of the A-37B's wing tip 75 imperial gallon tanks over the wing. This Boeing 767-300BDSF, N331AZ (c/n 24875), pictured on approach to Cincinnati in October 2017, is an IAI Bedek-converted 767 freighter operated for Amazon Prime Air. 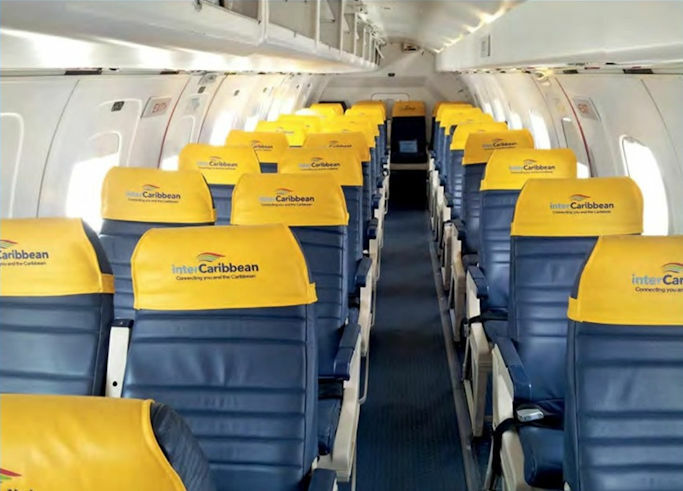 Growing e-commerce and a plentiful feedstock of aircraft are stimulating demand for conversions. An MQ-9 Reaper configured with the two sensor turrets of the Gorgon Stare II wide area airborne surveillance system at Kandahar Airfield, Afghanistan. Air National Guardsmen watch an MQ-9 Reaper unmanned aerial vehicle during Combat Hammer at Duke Field, Florida. 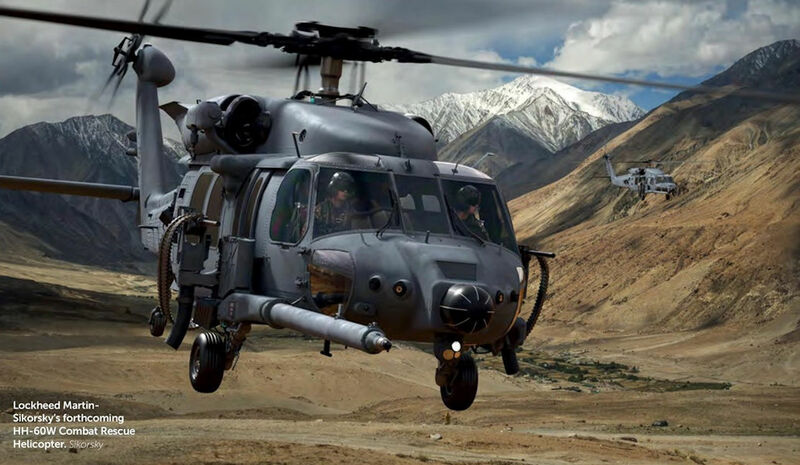 Combat Hammer is Air Combat Command’s Weapon System Evaluation Program for air-to-ground weapons. 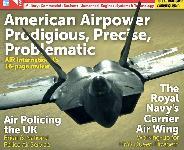 The evaluation staged in February 2017 was the first air-to-ground weapons evaluation of the Air National Guard's MQ-9 Reaper mission set. 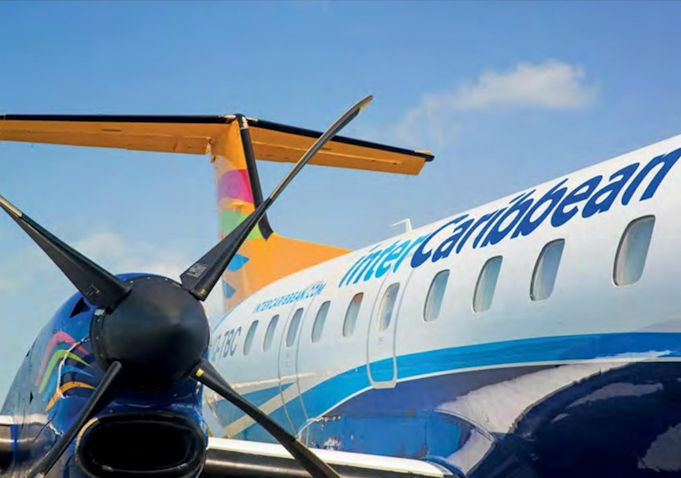 Embraer's EMB 120 is powered by two Pratt & Whitney Canada PW118-series turboprops each rated at 1,800shp (1,340kW). 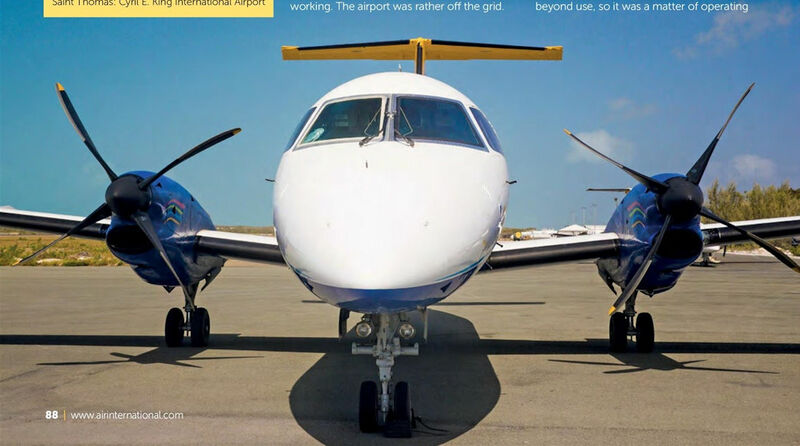 EMB 120RT Brasilias on the hard stand ahead of the next flight. 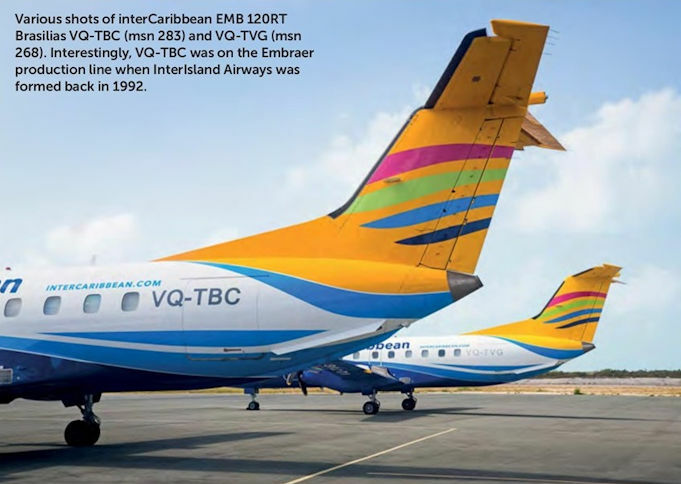 Shot of interCaribbean EMB 120RT Brasilias VQ-TBC (msn 283) and VQ-TVG (msn 268). 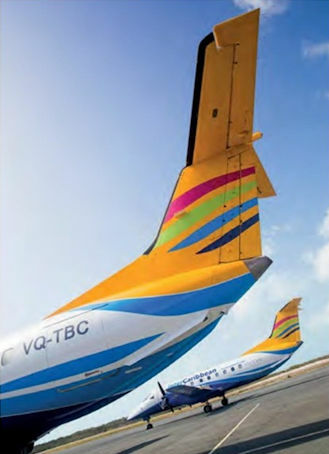 Interestingly, VQ-TBC was on the Embraer production line when InterIsland Airways was formed back in 1992. 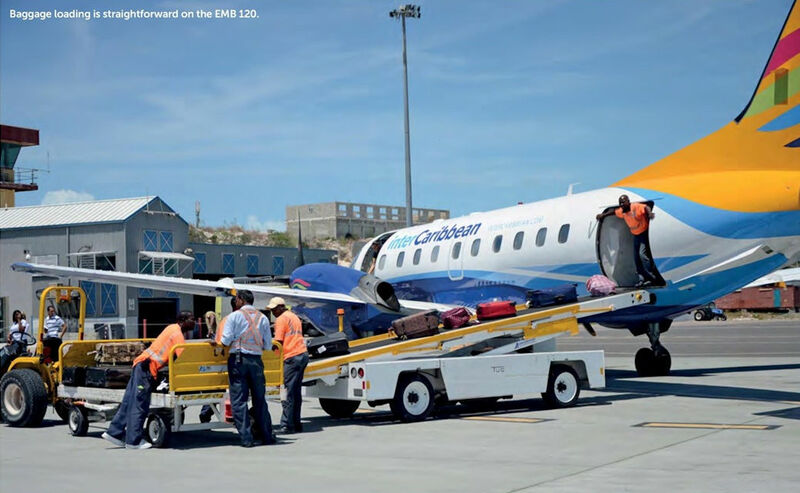 Baggage loading is straightforward on the EMB 120.
interCaribbean's EMB 120RT Brasilia cabin configuration. 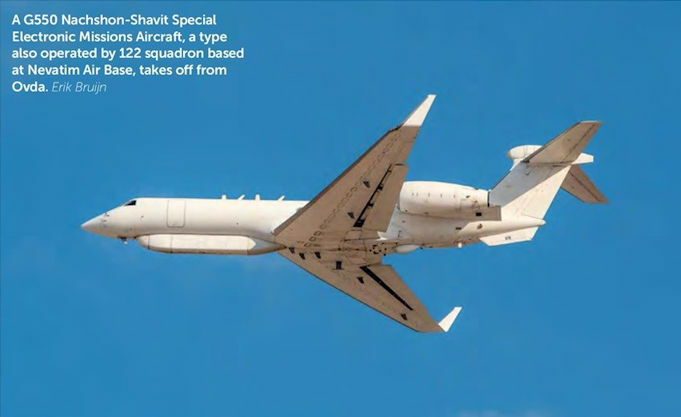 A G550 Nachshon-Shavit Special Electronic Missions Aircraft, a type also operated by 122 squadron based at Nevatim Air Base, takes off from Ovda. 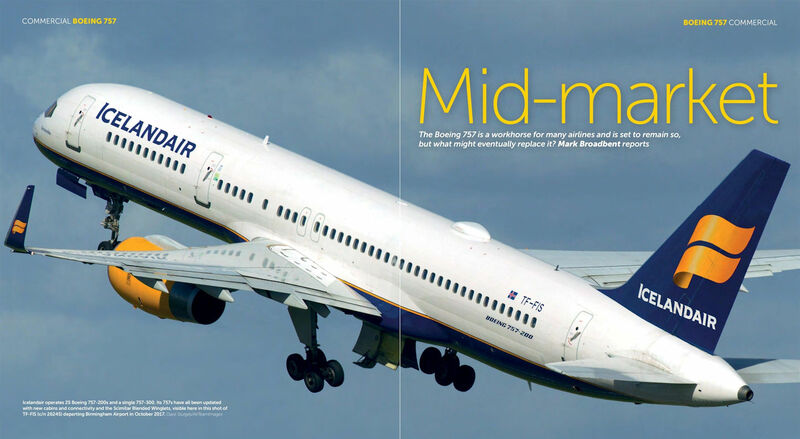 Icelandair operates 25 Boeing 757-200s and a single 757-300. Its 757s have all been updated with new cabins and connectivity and the Scimitar Blended Winglets, visible here in this shot of TF-FIS (c/n 26245) departing Birmingham Airport in October 2017. 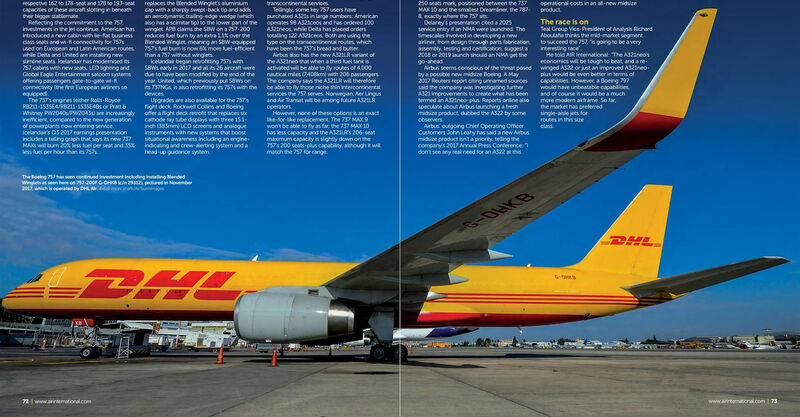 The Boeing 757 has seen continued investment including installing Blended Winglets as seen here on 757-200F G-DHKB (c/n 29312), pictured in November 2017, which is operated by DHL Air. 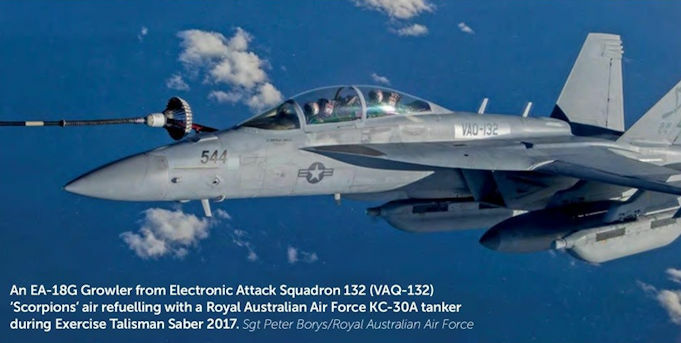 An EA-18G Growler from Electronic Attack Squadron 132 (VAQ-132) 'Scorpions’ air refuelling with a Royal Australian Air Force KC-30A tanker during Exercise Talisman Saber 2017. 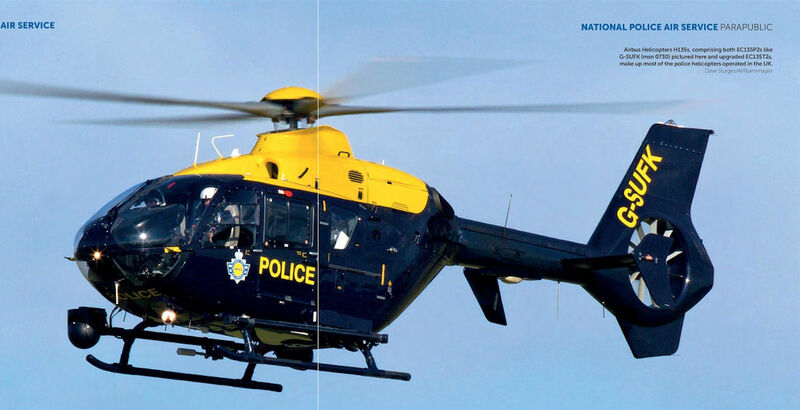 EC135T2+, G-POLB (msn 283), was the first of seven upgraded EC135s handed over by Babcock MCS (Mission Critical Service) to the National Police Air Service. 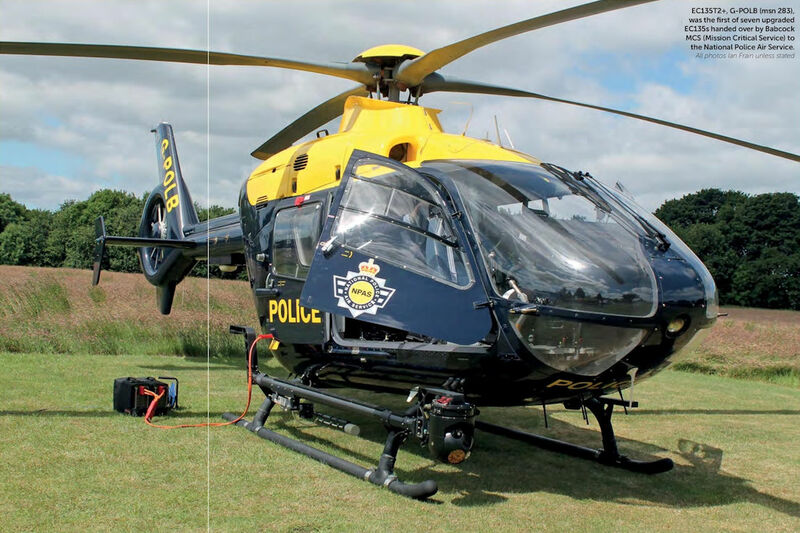 Airbus Helicopters H135s, comprising both EC135P2s like G-SUFK (msn 0730) pictured here and upgraded EC135T2s, make up most of the police helicopters operated in the UK. 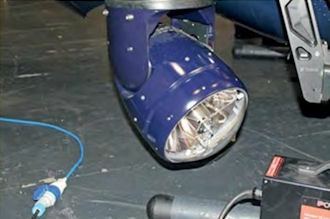 The Spectrolab SX-16 searchlight mounted on NPAS H135s has 30 million candle power. 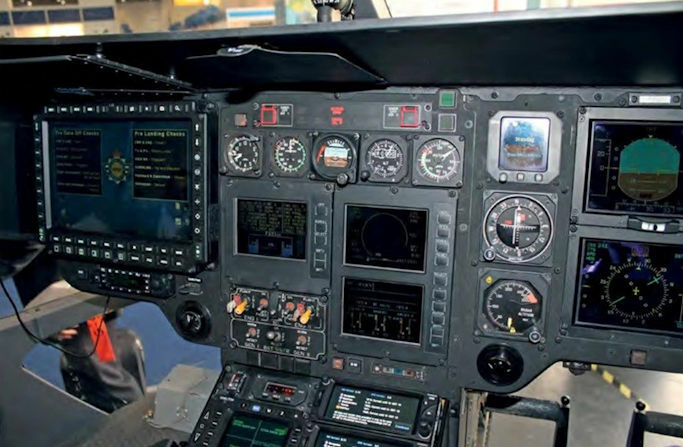 Avionics aboard the UK's single pilot instrument flight rules-certified police helicopters includes the Nouvelle centre panel display system and flight control display system. 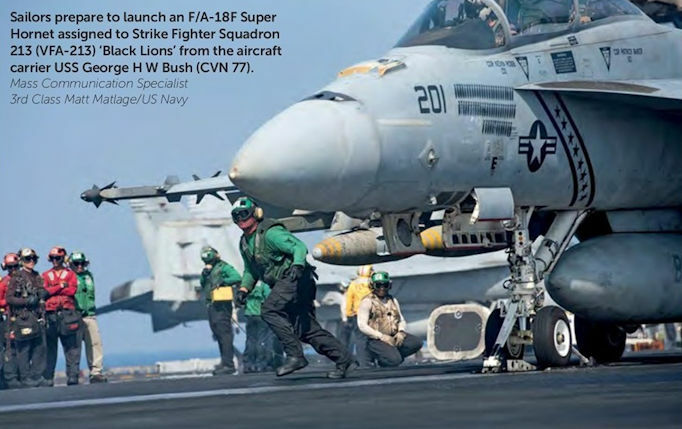 Sailors prepare to launch an F/A-18F Super Hornet assigned to Strike Fighter Squadron 213 (VFA-213) 'Black Lions' from the aircraft carrier USS George H W Bush (CVN 77). 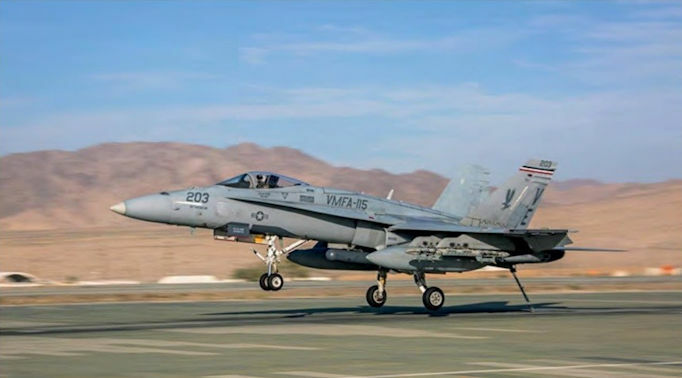 F/A-18F Super Hornet BuNo 166969/SD123 assigned to Air Test and Evaluation Squadron 23 (VX-23) flies over USS Gerald R Ford (CVN 78) during ship integration testing. 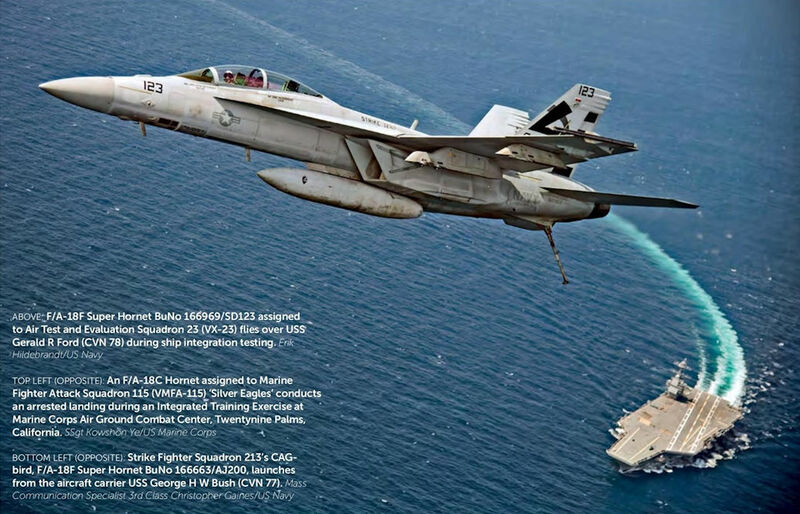 Strike Fighter Squadron 213’s CAG-bird, F/A-18F Super Hornet BuNo 166663/AJ200, launches from the aircraft carrier USS George H W Bush (CVN 77). 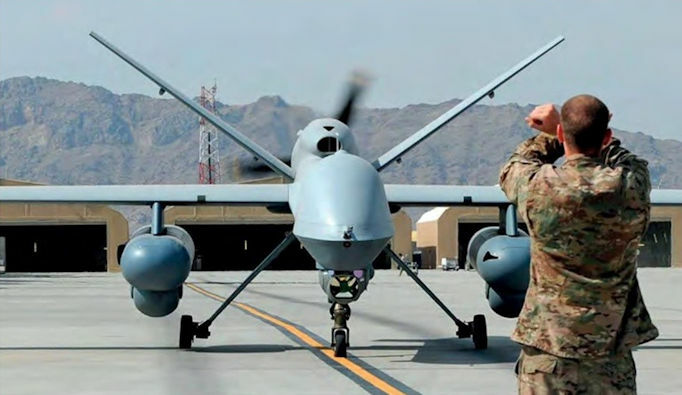 An MQ-1C Gray Eagle unmanned aerial system, belonging to Company D, 10th Aviation Regiment, armed with two AGM-114 Hellfire air-to-surface missiles at Al Asad Air Base, Iraq. 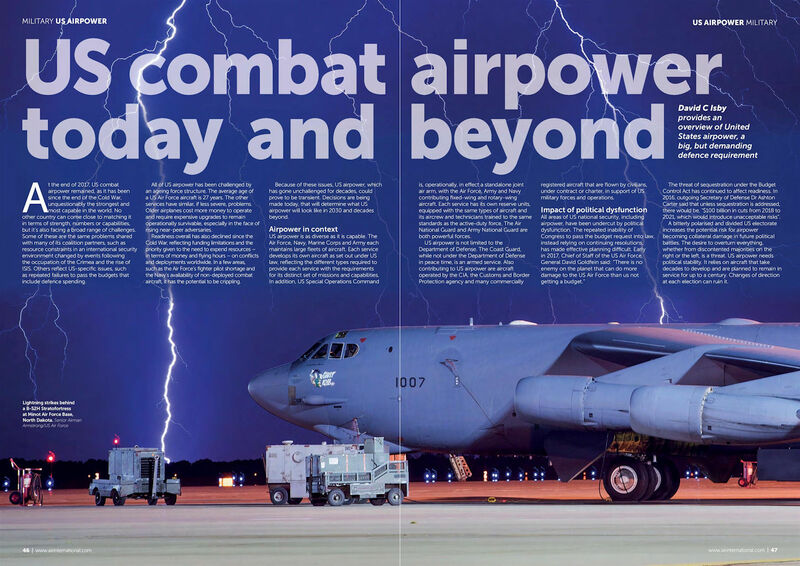 C-130J Super Hercules KC-3806 was the first Indian military aircraft to participate in Israel's Exercise Blue Flag. 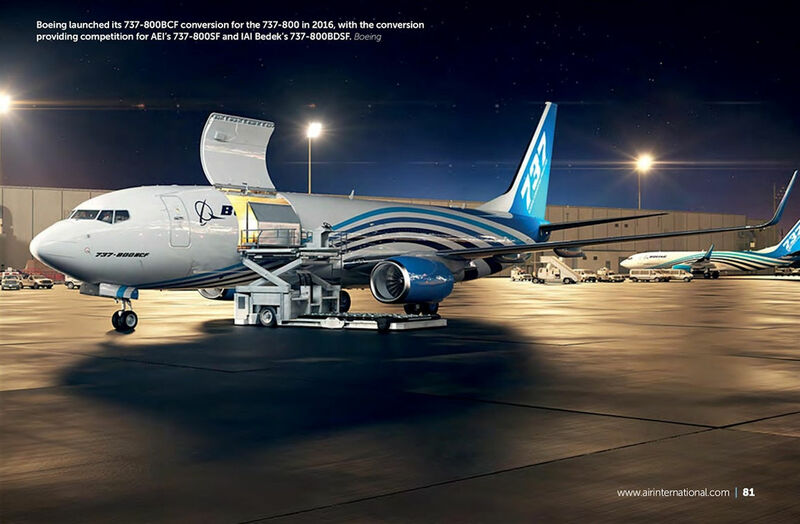 Boeing launched its 737-800BCF conversion for the 737-800 in 2016, with the conversion providing competition for AEl's 737-800SF and IAI Bedek's 737-800BDSF. All four system demonstration test article CH-53K King Stallions at Sikorsky Aircraft's facility in West Palm Beach, Florida. 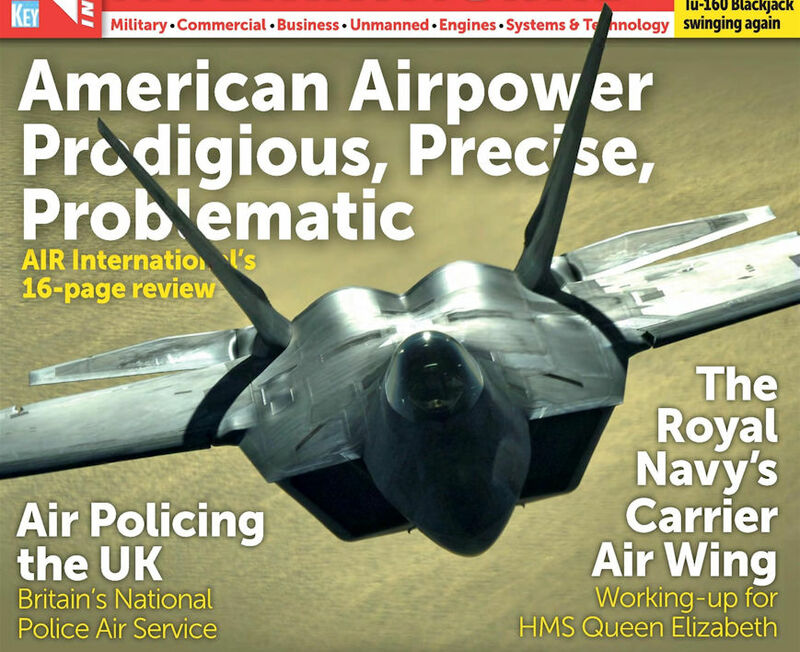 An F-35 Ground Training Aid (GTA) is towed into position on deck by Royal Navy flight deck handlers. 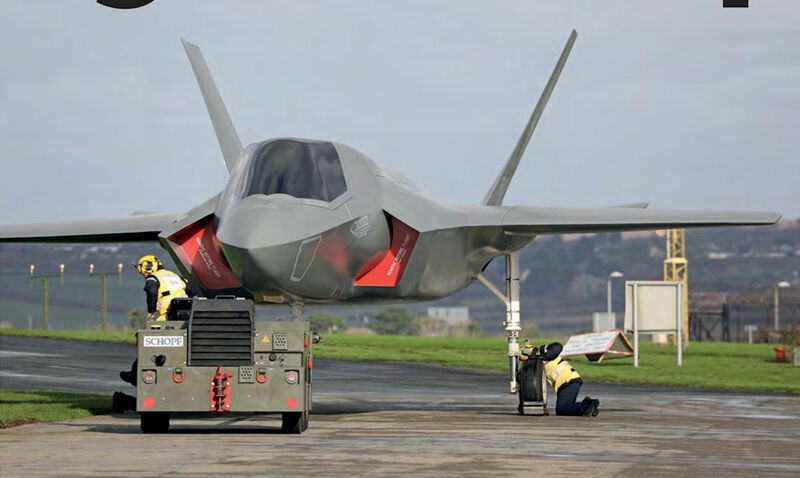 Built of fibre-glass, GTAs are dubbed faux fighters and enable handlers to get used to the size and weight of a real F-35B; each GTA is fitted with water tanks to simulate fuel and weapons loads between 16 and 24 tonnes. 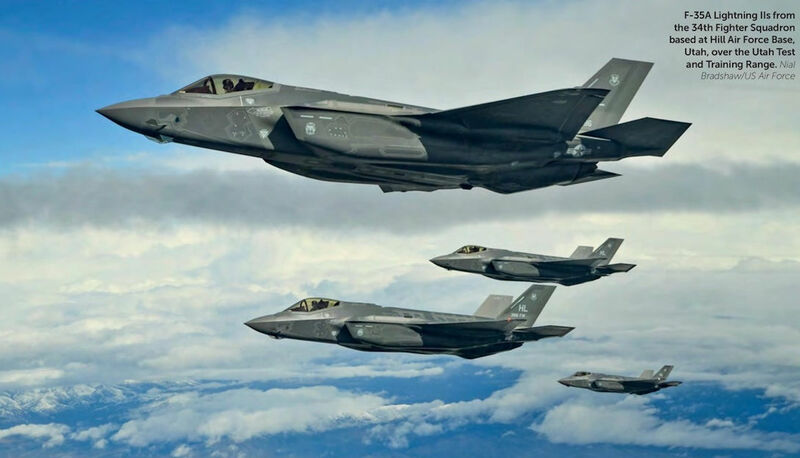 Four are assigned to the School of Flight Deck Operations. 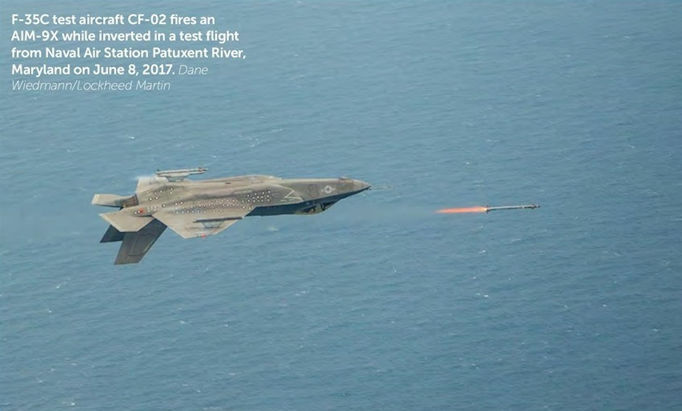 F-35C test aircraft CF-02 fires an AIM-9X while inverted in a test flight from Naval Air Station Patuxent River, Maryland on June 8, 2017.